When it comes to your website’s security the very first thing you can do is employ the best security measures. If you are looking for the best security modules for your Drupal website then you have come to the right place. I will show you the most favored and widely used Drupal security modules. Do you know what is Drupal? I am sure you do! Drupal is an open source third most widely used CMS around the globe. Like any other major platform such as WordPress and Joomla, Drupal security is also a big concern for business owners. With the increase in Drupal’s popularity, the chances of a Drupal site coming under the cyber attack are higher than ever. Thus, you can never take your website’s security for granted. In fact, it is a continuous process that needs your attention at all times. Because the security breach will not affect your website resources but also put your website reputation at stake. Drupal is an extremely powerful system and it has numerous security modules to prevent any loss. It is a good practice to make use of Drupal security modules to minimize security breaches. By the end of this post, you will learn how easily you can boost your Drupal security. I have curated a list of must-have Drupal security modules to ensure your website’s security and help you escape any potential cyber-attack. Take a look. CAPTCHA is the most popular, prolific and first line of defense security module. It is basically a reaction test of the user framed in the web to eradicate bot entries to a Drupal website. You would see only genuine signups and contact forms with CAPTCHA. It is an ideal pick to keep spambots and spammers away. It is a highly secure Drupal security module with 2,587,914+ active installs. So, having CAPTCHA plugged in, ensure double security for your Drupal site from various harmful spambots and spammers. SecKit has really tough security options for Drupal. Security Kit slashed the probability of exploitation of various web application vulnerabilities. It can easily deal with issues such as Cross-Site Request Forgery, Cross-Site Scripting, SSL, Transport Layer Security issues which gets tough for browsers to prevent. This module can fix the HTML injection issue with ease. You can flawlessly implement it in your Drupal website and safeguard your site from any external attack. Currently, it has 629,357+ active installs. This module help to enforce constraints and guidelines for determining the account password. As a site administrator, you can standardize the password for login. It offers a lot of functionalities related to password handling along with endless configuration options. With each constraint, the module has a pre-defined set of parameters which must be met before a user password change will be accepted. In Drupal 8, you can use Password Policy as a plugin. Also, this module comes with an expiration feature where a user is either forced to change the password or it optionally blocks the user once the password expires. As per drupal.org following constraint type is mandatory in the password policy. This is how this module sets a credible policy for passwords by controlling the structure of the password. And that’s what makes the module so popular with 770,674 active installs. Security Review is widely used and one of the best Drupal modules. 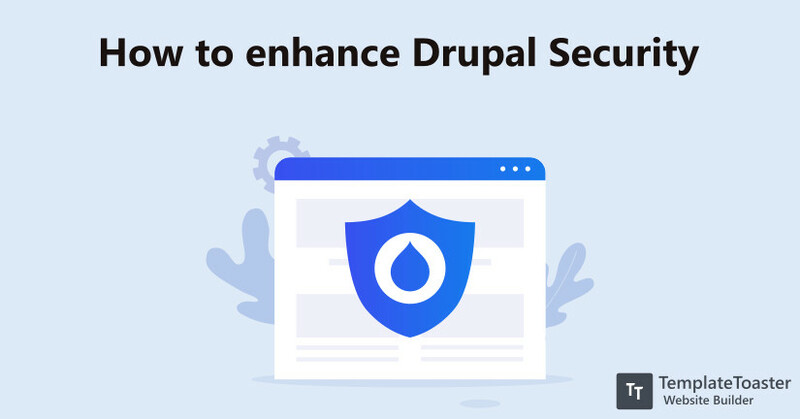 This module will do the security review of your website and will let you know if your site needs any improvement to enhance the Drupal security. It maintains the list of checks, and scans the website against these checks to make sure if it requires any changes in the policy to improve the security. And if the site requires any changes it notifies the recommendations. As it does not automatically make any sort of changes to the site, you need to do it as per your requirements. It includes dozens of checks such as failed logins attempts logging, file system and Drupal permission, arbitrary code execution prevention, protection against access misconfiguration, avoiding information disclosure, protection against phishing attempts and much more. You should have the habit of doing security checks every 3 months in order to enhance Drupal security. Automated Logout module is an essential module to reinforce Drupal security. It allows the administrator to implement a policy which automatically logs out the user after a specified time of inactivity. It is a highly customizable module that lets you (the administrator) specify the timeout based on role. Furthermore, it integrates the Java mechanism to keep users logged in even if the user is working on the form for so long. It has greatly boosted the Drupal security. Also, allows the admin to set a time limit for a particular session and disable session timeout for different user roles. Login Security is considered as one of the most powerful Drupal security modules available with more than 204,984 active installs. This Drupal security module reinforces the security to your login page/form so it limits the rate of login attempts. The site administrator may deny the access or block the IP address temporary or permanently. Moreover, it sends a notification email about the too many invalid login attempts. Other controls include Drupal’s core login error message with confound reason for login failure. So that attacker can not track the reason for login failure as well as last login details. Credential stuffing is the common form of a security breach that attacker use nowadays. Although Drupal is a secure platform, still the chances of exploitation are there. Especially if you’re haven’t updated your website from version 6. Drupal 6 does not support brute force prevention functionality. Therefore, Drupal 6 websites are likely to be attacked easily. So, you need to protect your username. And this is where Username Enumeration Prevention comes for rescue. This makes the username tough for hackers to guess. When you enable this module then after a wrong attempt an error message will be replaced with a preview message and user will be directly redirection to the login form. It simply disables the status message that can be helpful for the hacker to guess the username. Quite self-explanatory Session Limit allows the admin to configure the maximum number of simultaneous sessions allowed per user. As a session is set for every browser that a user is logged in at. It force the user to log out any extra session after they exceed the admin-defined session limit. For example, if the admin has set the limit to 1 session per user and the said user can log in from one browser at a time. And if the user tries to log in from more than one browser at the same time then either he will be asked to log out from the previous browser before logging in another browser or abort their new login session. This Drupal security module has pre-released version for Drupal 8. Two-factor Authentication adds a double layer of security to your Drupal website. It allows you to add another cover of safety in the login of your Drupal website by employing two-factor authentication strategy such as an OTP (One Time Password) sent on your registered mobile phone. The main advantage of sending an OTP is to give access to the genuine user if he has forgotten the password. It also includes solutions like Time-Based One Time Password (TOTP), Pre-generated codes, SMS delivered codes along with the integration with third parties such as Duo, Authy, etc. It has a pre-release version available for Drupal 8. Currently, it has 77,452+ active installs. Here is a quick recap of all security modules so you don’t forget to install in your Drupal website and keep your site safe. So, these were some of the cherry-picked Drupal security modules to keep spambots and attackers away from your Drupal site. Since security is a crucial matter so you need to constantly check for possible security threats. Please note that I have provided you with the list of best of Drupal security modules. But there are plenty of other Drupal security modules available to make use of. Moreover, to keep your site SEO-friendly you must follow this ultimate Drupal SEO guide and manage the traffic. If you are planning to create a Drupal Website, you can create it with TemplateToaster Drupal Website Builder like a breeze. I hope this post will resolve some of your Drupal security concerns. If you have any other Drupal security suggestion that you think I missed, let me know below in the comments.